Wan Lu Yuan (Evergreen Park) is located on Binhai Avenue. It is a popular place to relax and exercise. During festivals or special events there are often special decorations set up. During the weekend many amateur performers come here to play music and to dance. 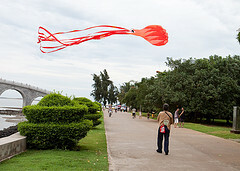 Kite flying is also very popular. There is an amusement area where you can play games and also places to eat and drink. Pedal cars, electric cars and bicycles are available to hire.